Yes, this is yet another chicken curry recipe and that’s why the title remains. More often than not, many recipes have the same ingredients and methods of cooking. But every once in a while you can change a couple of things and turn it into a new dish. I was binge watching Chef John’s Food Wishes channel on YouTube because there is hardly anything more entertaining than when food and humour come together. Anyway, in one of his Indian recipes he grinds the onion and tomatoes together before adding it to his dish. The norm is to grind them to pastes and purees separately and then go about your business. This method was different. It’s very hot here in Gurgaon and I’m keeping things light. Even my Sunday curries. No heavy masala to weigh me down and bring out the meat sweats. A delicious curry with a few spices that are meant to be cooling and some coconut milk makes it so good. It still is a spicy curry but without a ton of masala in it. The spices I used were peppercorns, cumin seeds and coriander seeds. I ground it with some fresh coconut and cooked the chicken in it with the coconut milk. With some rice and roti, this was an awesome Sunday lunch. Leftover greens in the fridge make for great curry bases. In this case I had a bunch of palak that were on the verge of wilting on their own. So I added some methi and coriander to the mix and cooked some chicken in it. It was perfectly light and delicious. As summer crawls back into our lives, food must also get lighter. Heavy masala based curries gives me the sweats and keeping Sunday lunches light is my main goal this summer. Even the spices I used were mostly pepper, coriander, cumin and fenugreek seeds. Helps cool off the body. No wonder these spices are a huge part of Mangalorean cuisine. Every weekend, Sunday in particular, I try and cook different kinds of curries with chicken or mutton mostly. Some recipes call for elaborate processes and I’m rarely drawn to such. That’s why I put together a few ingredients myself and make a curry base that goes well with meat. This time I did it with green chilly. A simple paste of the chillies, whole black pepper, coconut, cumin and coriander make for good curry base. All you need to do is chop some onions and mix it in with the chicken and let it all cook together. Butter chicken is probably India’s favourite dish. It sure is the most ordered one in restaurants across the country. There’s something so delicious about tandoor cooked chicken and smooth and creamy tomato sauce laced with fresh cream. Of course, you can’t forget the butter here. It’s used in the cooking as well as a garnish. How dare one use just oil or ghee?! It’s sacrilegious, for the love of food! Alright, enough drama. I’ve had butter chicken at most restaurants in Bangalore and here in Delhi/Gurgaon. And the best butter chicken according to me was had at Downtown pub, Gurgaon. Yep. A pub. Silky smooth gravy and superbly cooked chicken. Not sweet like I’ve found plenty others to be and not bland either. It sure is a challenge to find different ways of turning an ordinary chicken curry into a Sunday special curry. Besides, I look forward to Sunday curries – chicken or mutton. Having said that, I did make this Sunday’s chicken curry a tad special with freshly ground spices and curry leaves. I pictured in my mind a curry that’s dark in colour and deep in flavour. The colour I thought would come from whole pepper and curry leaves to give it a fragrant kick. And of course, I deseeded the Kashmiri chillies I used. It’s always better that way for me – all the colour and flavour, not too much of the heat. With some piping hot rice, my husband lapped it all up! I’ve always been a fan of ground masala with coconut and whole spices to make the base of curries. But every once in a while I turn to powdered spices. 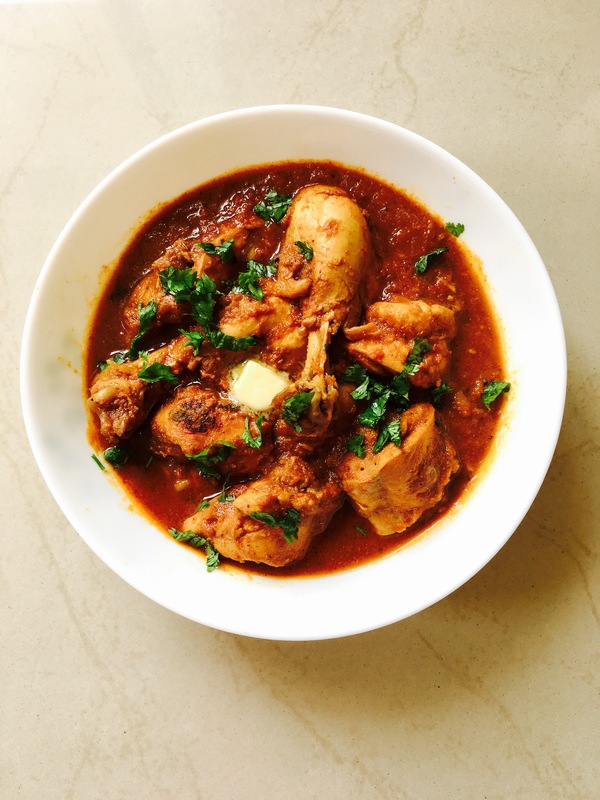 This chicken curry is probably a common one in most households. I think so because its base is an onion-tomato one as opposed to coconut. I remember mum making these on Sundays when she picked the easy option. But personally I find the coconut based masala a lot easier because I don’t have to saute anything for a long time before adding the chicken and cooking it further. Although, this one is easy because only powdered spices are used and it’s a good start if you’re not very confident with cooking yet. It’s that time of the month when the bank account runs dry and so does enthusiasm. Maybe they’re connected in some way. This is when I forage my fridge for leftovers and other ingredients to cook a decent meal. This time around I had ginger, garlic, green chillies coconut milk, tomatoes and apples. I kept the tomatoes and apples aside and went on to make some chicken curry with the rest. I got boneless chicken for this, of course. This curry has basic ingredients but tasted pretty good. It works well if you’re in a hurry or if you’re new to cooking. Especially with chicken. Feel free to tweak it by adding other spices like cumin, pepper, etc. Saute onion in some oil till translucent. In the meanwhile blitz together the ginger, garlic and green chillies till they form a coarse paste. Add the ginger, garlic and chilli mixture to the onions. Saute for another 3 mins. Tip the chicken pieces in and stir them around. Add the rest of the ingredients with a splash of water. Cover and cook on low flame for 15 mins or till done. Cooking time depends on the size of the chicken pieces. If they’re small let it cook for 10 mins. Always check by cutting open the biggest piece. Garnish with coriander leaves. Serve with rice or roti.